Should or should not I post online income. I guess everyone will not post pay slip on payday of their employment. So, what makes me think that it different to the online income ? I guess sharing online income was not that bad and it was not that secretive either way. In the other hand, the traditional pay slip we got every end of the month just does not feel sharing it online. I do not really want to brag about my online income but it should be something proud of guess so. I still post it without covering the letterhead of a big financial company logo. It is a daring move hoping that nothing really happen to me on the legal side. Do not want one day lawyer knocking at my door saying that I have done something wrong in the legal point of view. My intention is pure not for personal gain to help and share so that other could enjoy the knowledge and experience. Nuffnang will send cheque covering HSBC letterhead to its member who successfully earned over the threshold which is RM50. It takes something like 1 month to reach one home. 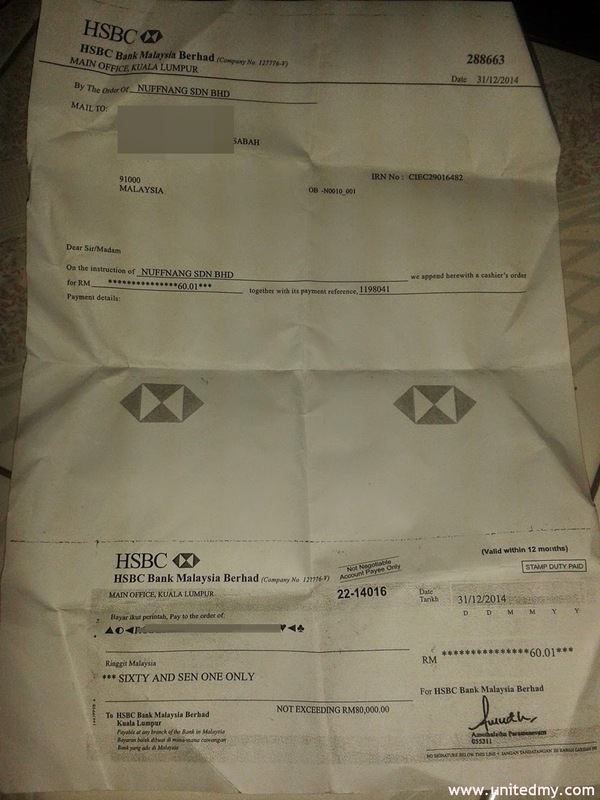 As you can see on above image, I live in Sabah and I still able to retain this cheque from post office. Nuffnang Malaysia is smilar to Google adsense. Sometimes, Nuffnang ads is much more lovely and standout. As for Google adsense it is unrivaled source of online income. Both are not competitor I suppose and blogger could retain both of them in a single blog. I still love both. Hard to turn off one when have to choose one of them. I do not wish one day when decision to pick one come suddenly, decision making process be like choosing between father and mother, who do you love most ?? I will love one most if one of them creates an option direct transfer all my earning to my bank account. I wish every bloggers out there could earn some online income. I can, you can too! Be positive and patience in Nuffnang, one day the reward you will reap when you sow the seed patiently and effectively.